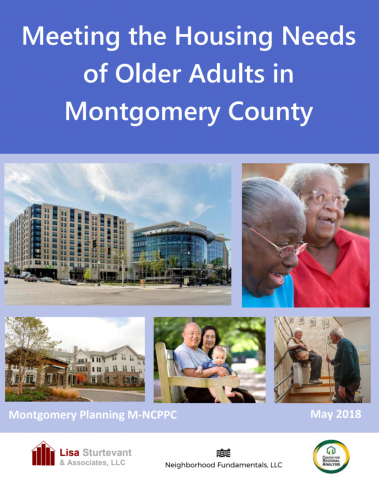 SILVER SPRING, MD – The Montgomery County Planning Department, part of The Maryland-National Capital Park and Planning Commission, has completed a study of senior housing needs in the county and will present the findings to the Montgomery County Planning Board on May 24, 2018. View the Study of Housing for Older Adults in Montgomery County. View the May 24 Planning Board Staff Report. The study was undertaken by the department’s Research and Special Projects Division in response to the county’s growing number of residents aged 55 and older – estimated to be nearly 288,000 people — and the housing challenges this population faces. Consultant Lisa Sturtevant and Associates worked with the George Mason University Center for Regional Analysis and Neighborhood Fundamentals to assess the housing needs of seniors in Montgomery County. Among the goals of the research are to quantify the supply of housing serving older adults in the county; document the characteristics of the senior population; assess current and future demand for senior housing – both the amount and preferred housing types; and recommend ways of preparing to meet growing senior housing needs. By 2040, one in five residents in Montgomery County will be 65 and older, and one out of three will be 55 and older. The unprecedented growth in the senior population suggests significantly growing housing and service needs for an aging population. About 15.5 percent of households headed by someone 55 and older spend more than half of their incomes on housing costs each month. This number of severely cost-burdened households suggests unmet housing needs among older adults in Montgomery County. In addition to the need for affordable and accessible housing for very low income and the oldest residents, there is likely current unmet demand for smaller homes to serve the county’s older adult population. More seniors in Montgomery County will be renters in the years to come due to changing economic characteristics of older adult households. The oldest seniors face the greatest challenges and their numbers are growing, but the vast majority of assisted living facilities in the county are not targeted to older adults with limited incomes. Most older adults would like to age in place while living in their homes independently rather than relying on institutionalized care or family members. Access to neighborhood amenities and services is important to aging in place. Federal funding for senior housing programs is declining. Support proposed changes in the moderately priced dwelling unit (MPDU) program to support more affordable housing options for seniors. Co-locate senior housing with community facilities and use publicly owned property to produce senior housing. Address senior housing needs in the planning process. Allow more diverse housing types in residential zones and improve the viability of accessory apartments for older adults. Remove zoning and regulatory barriers to group homes and age-restricted housing. Maintain a commitment to senior housing in Montgomery County’s affordable housing fund, the Housing Initiative Fund (HIF). Create set-asides for older adults in the housing choice voucher and rental assistance programs. Improve the effectiveness of homeowner and renter property tax exemptions and credits. Fund emergency assistance to seniors at risk of eviction or homelessness. Expand Montgomery County’s “Design for Life” program to educate developers about marketing opportunities and benefits of accessible housing and to offer additional incentives to include a higher number of accessible units in multi-family developments. Support naturally occurring retirement communities and existing volunteer-led, senior villages. Create a one-stop shop for senior housing programs and services. Explore funding possibilities for senior housing through Maryland’s Medicaid waiver program. Read the complete Senior Housing Study online. Please note, 2016 is the most recent year for which data is available at the time of the analysis. For more information, please contact researcher Pamela Zorich at 301-650-5639 or pamela.zorich@montgomeryplanning.org.